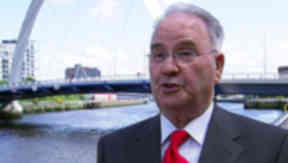 The 78-year-old former MSP will seek to succeed the departing Michael Martin by running an anti-sleaze campaign. John Swinburne has confirmed he is standing in the Glasgow North East by-election and will do so under the banner of the Scottish Senior Citizens Unity Party. Mr Swinburne, 78, will be running as an anti-sleaze candidate in response to the revelations of expense abuses by some MPs. He said he will also highlight pensioner issues. Mr Swinburne was an MSP in the Scottish Parliament for four years up to 2007. STV news first reported on Wednesday Mr Swinburne's interest in running for the seat being vacated by Michael Martin. Hours later, Mr Martin confirmed he would step down as an MP as well as from the post of Speaker on June 21. The by-election must take place by early October. Gerry Leonard, who was Mr Martin's election agent and who is also chairman of the constituency Labour Party, said he would expect the election to be in September, although there was "a chance" it could be over the summer months. Mr Martin held the seat in 2005 with a 10,000 majority over the SNP, but no other major party contested the Speaker's seat in line with convention. The seat borders the Glasgow East constituency where the Nationalists overturned a 13,500 majority to take the seat from Labour last summer.